Had a fab run at Somerford with Massimo where at last we met some decent turning fences at 100, testing him ready for Novice and he jumped them easily. He’s just awesome XC one of the nicest XC horses I have ridden ever. Then he had to be withdrawn from the next 2 events first due to a mild virus, that started with a few days of sneezing fits and finished with 3 days with a mild cough. He was soon over this but then while he was off he managed to lose a shoe and stand on it, giving him a foot infection. He is now back in work and hopefully will manage an event or two to finish the season. Come on Massimo you are meant to be out competing & advertising our sponsors fab new product The Haygrazer. Frustrated with one less to ride, I decided to get Captain back in work. He’s at last looking fat and mature, definitely ready to continue his education. He was turned away in the Spring after he lost a lot of weight being castrated and then being broken in, so now he’s looking amazing I couldn’t wait to do a bit more with him. With these three – Captain, Dippy and Diva – I have a yard full of babies which is hard work, fun, sometimes tedious and extremely rewarding. My days vary from being thrilled to bits with them all to stressing that the road to them being successful Eventers seems awfully long, especially when I can’t even get into the corners of the school!!! I am doing endless hacking, schooling and more hacking in an attempt to turn them into safe, confident & trainable horses. They all seem to love their work, Diva in particular is very brave & is just the most perfect horse ever, Captain is about 4 months behind them in his training so it’s hard to tell yet where his strengths lie, but my initial thoughts are trainable, huge jump and a really nice person who looks posh on the flat! All three have become chicken proof, Hugo proof, leaping cat after a mouse proof and barking dog proof (courtesy of some terrifying dogs which chase, bark and snarl at the horses as we hack past). Luckily they are safely contained within a garden fence, although I always wear my hat cam just in case they ever escape. Had some fab news (feeling a very proud coach) from various clients in July & August too, Saffron Cresswell won team Silver in the Pony Europeans, Alex Holman gained his first placing at a BE event in a Novice, on a horse he has produced from scratch, Saskia Davies pulled off her horses PB dressage score of 30 also in a BE Novice, Alice Ward won her first BE point and is now aiming for a CIC*. Then to top it all the Ledbury Pony Club Teenagers, whom I train, all passed their B test. 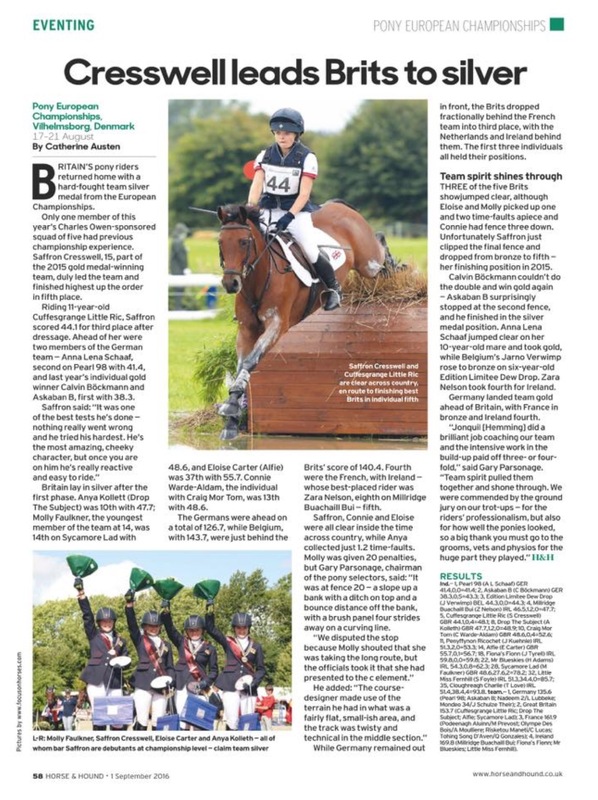 Click on the below image to read the full Horse & Hound report from Saffrons Silver Medal win in Denmark.